I think that’s who L.A. Galaxy Coach and GM Bruce Arena is channeling this offseason. Faced with replacing literally the greatest American footballer ever, the retiring Landon Donovan, it would seem the Galaxy are turning to one of the greatest Brazilians ever to lace up the boots–Ronaldinho. Is this the right move for this squad? Let’s dig into this issue a little bit. I’m a bit torn about this rumor. 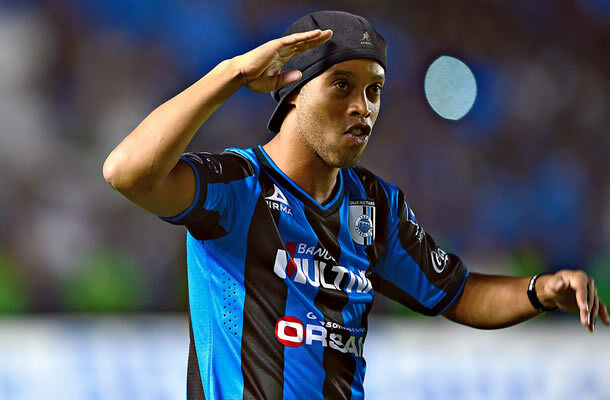 On the one hand, we all grew up watching Ronaldinho, and it will be pretty awesome to see him running up and down the pitch at the StubHub center in Carson, CA. In his prime, Ronaldinho was probably the best player in the world. From his beginnings at Grémio in Brazil to his time with Paris Saint-Germain to his great runs with Barcelona and the Brazilian national team, nobody could stop this guy when he was on his game. Even in his less successful run with AC Milan, he still showed flashes of that brilliance. Overall, he scored 107 goals in his 276 European matches. Not a bad run. All that being said, Ronaldinho is 34 years old, and far removed from the days when he was winning World Cups and La Liga titles. In 2011, his career hit a bit of a downswing, and he ended up playing back on his home soil–at first for Flamengo and then Atlético Mineiro, where he scored 32 goals in 80 games over three seasons or so. During this past summer transfer window, he ended up signing on a free transfer with Querétaro of Liga MX, where he has experienced a bit of a resurrection, scoring 3 goals in 8 games and looking pretty good overall. This is not, by any means, the same explosive and brilliant guy we saw with Brazil, PSG and Barcelona. I have no doubt that Ronaldinho’s star power would put asses in the StubHub Center seats. He’s a bonafide star–a name even bigger than Donovan’s, and the great David Beckham too. If he can continue his resurgence for another year or two, he could be a very serviceable player for Los Angeles. Also, the Galaxy are the most high-profile and stored franchises in MLS–a global brand despite being in existence for barely 20 years–and it’s a club that, almost uniquely, needs to have stars, like Mr. Galán said. Is Ronaldinho, at this age in 2014, the right man for the job? I’m going to actually say that yes, he is. Whether it’s Ronaldinho, Steven Gerrard or Andrea Pirlo, the Galaxy need to bring in a big name to replace Donovan for a couple of years, as they work behind the scenes to find a real, long term replacement. Ronaldinho should still be good enough to play well in MLS, and his star power will make the team a lot of money (think of all the jersey sales alone!). I say bring him in for two years, win another MLS Cup and send him to the retirement he deserves.